I would like to share with you several thoughts about method. Because perhaps my blog has inspired you to set out and read more ancient, medieval, (‘counter’)Reformation, ‘modern’ Christianity. There are two important, and (I believe) valid ways of reading historical Christianity — one is a devotional quest that asks, ‘What does this writer/piece of art/piece of music speak to me?’ This need not know history — but it must never parade as history. The other, which I am to address now, requires the careful study of historical methodology to bring out different treasures than the above, the treasures that represent the authorial intention of a piece, the realities it addressed in its specific context and time. These, if of use, can still often be applied to today, just as the above is automatically applied. Both, I repeat, are valid as approaches to texts as pathways to the divine. But only the second is worthwhile as an approach to historical theology or the history of Christianity. One area where the first and second often blur is the study of early mediaeval Christianity in Britain, Ireland, and associated smaller islands in their vicinity (henceforth ‘Insular’). This is most often perpetrated in the guise of an imagined ‘Pan-Celtic’ form of Christianity whereby all the quite varied cultures and polities and Celtic languages of Britain are imagined to be united in a golden age that precedes a post-seventh-century ‘Romanisation’ of Insular Christianity. That’s something I’ve dealt with briefly before, and will mostly put to the side in what follows, as I turn my attention to the varied Germanic-speaking peoples who settled in Britannia following ca. AD 410 and whom we (and, eventually, they themselves) call ‘Anglo-Saxons’. The Germanic-speaking peoples of western, northern, and central Europe are also imagined to be culturally monolithic in much the same way Celtic-speaking peoples are. This sort of ethnography is not precisely helpful when trying to understand a particular object or moment of history. Let us turn now to the Ruthwell Cross, which is in modern Scotland (early mediaeval Bernicia-Deira/Northumberland) near the Solway Firth. It’s very awesome and worth a visit — I’ve blogged about it here. heaven’s Lord. I dare not bend. Christ was on the Cross. nobles, all together. I beheld it all. they laid him, limb weary. At his body’s head they stood. My concern, to finally start getting to the point, is that some people apparently argue that this poem as well as the powerfully majestic ‘Dream of the Rood‘ are based on earlier, pagan versions. The evidence that they are based on pagan versions comes from the fact that in Eddic poetry of Scandinavia (Iceland and Norway, to be precise), Odin hangs from the World Tree Yggrdasil as part of his acquisition of Wisdom. Now, if we wish to see all Germanic barbarians as the same, and especially Anglo-Saxons and their Norse cousins, this is a quick and easy interpretation to make. All sorts of things happened between the Anglo-Saxon migration to Britain, when they would have parted company with the ancestors of the Old Norse writers of the Eddic lays, and the writing down of the lays. And all sorts of things happened in the two or three hundred years between the Anglo-Saxon peoples’ arrival in Britain and the erection of this cross. The two hundred years of the Anglo-Saxons in Britain included the embracing of Christianity and a potential Christianising of a potential Odin poem; it also included various encounters with the post-Roman inhabitants of the islands and the cultures of Celtic-speaking Britain and Ireland. But did they have this particular myth about Odin? We can never know. We know they worshipped a divinity called Wotan; a conspicuous number of Anglo-Saxon kings trace their lineage to him. Yet it is dangerous to assume that we know any of the content of Anglo-Saxon pagan religious belief, which was probably at least as varied as Bede’s alleged Angles, Saxons, and Jutes. The Old Norse did have this myth. But in the eight hundred years or so between the Anglo-Saxon departure from the Continent and the Old Norse writings, all sorts of things happened to the Old Norse — they became Vikings, developed complex kingship systems, settled Iceland and Greenland, explored Canada’s East Coast, founded Dublin, conquered Normandy, became Christians, traded with peopls in eastern Europe, visited Constantinople…. 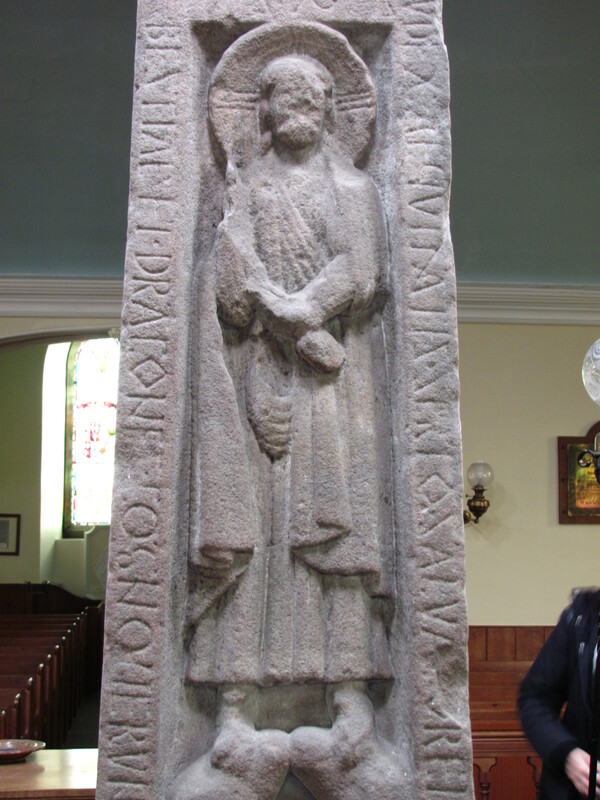 How can we say if this Odin story was the inspiration for the Ruthwell Cross? I believe that saying as much is part of the ‘all Germanic peoples are the same’ myth of modern ethnography as well as the false idea that barbarian conversions were all necessarily syncretistic to some degree, and therefore succumbing to parallelomania — if a ‘Germanic’ or ‘Celtic’ Christian does something (or even has a name) that resembles some a ‘pagan’ ancestor did, this is evidence of syncretism. Which, quite frankly, it very often is not. Note that the ‘banners’ would better be translated as ‘standards’ — thus, martial. Written by a Latin Christian within a strong, classical tradition of Latin poetry. What can we do with that? The cultures of the ancient and mediaeval worlds are not simply ‘warlike barbarians’ and ‘civilised Greeks and Romans.’ None of it is so simple, as the above shows. The values we stereotype as ‘Germanic’ or ‘Celtic’ were very often also ‘Classical’, especially in this period. My theory, since ‘Vexilla Regis’ is too late, is that there is a certain amount of cultural similarity throughout western Europe at this time regarding some aspects of the military in culture (that is to say, the rise of the warrior aristocracy), and that the Christians who live in a warlike age have warlike images of the crucifixion. The fact that Christ is hanging on a tree as a king in both cases requires no interference from Odin and Yggdrasil — for Christ is the king (very much so in the Anglo-Saxon hero-hagiographic poem Andreas) who hung on a tree. These are the real origins of the similarities, if you ask me, not some shared primeval Germanic memory common to Anglo-Saxons in southern Scotland in the 600s and Scandinavians in Iceland and Norway in the 1200s. 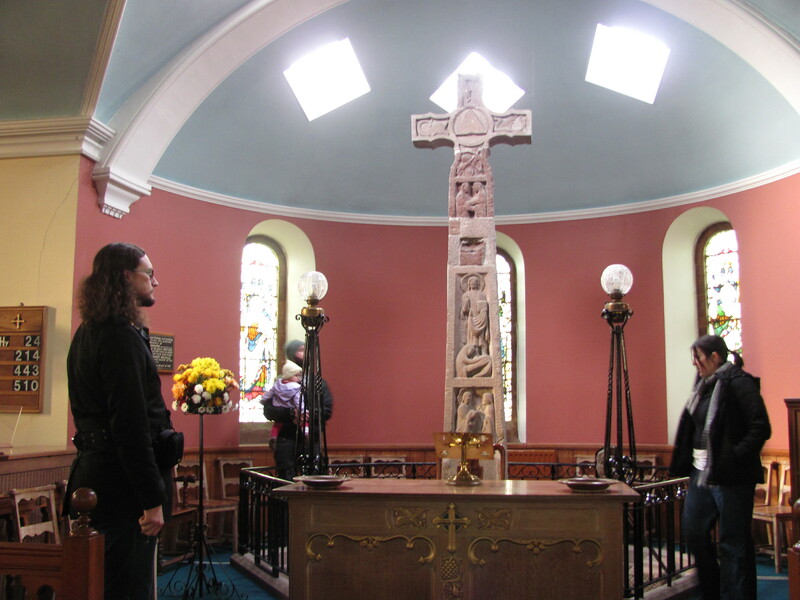 Now, not all of you have read the Ruthwell Cross Inscription, ‘The Dream of the Rood’, the Prose and Poetic Eddas, and Venantius Fortunatus, let alone some of the secondary literature. So how can you be a discerning reader? I mean, you’re not doing PhDs (well, some of you aren’t). Many good translations of sources come with good introductions. Unfortunately, while the Penguin Classics translation of documents pertinent to Alfred the Great comes with a good introduction, Letters from a Stoic by Seneca does not. So Penguins, though readily available, are hit and miss, both as translations and as introductions. However, I would say that you can generally trust the introductions to the volumes in the following series: Oxford World’s Classics, Translated Texts for Historians, SVS Press’ Popular Patristics Series, Ancient Christian Writers, and the Classics of Western Spirituality. Study is a spiritual discipline, so if you are really interested in, say, the devotional practices of St Cuthbert and other monks of Lindisfarne, be willing to take the time to verify how your sources are to be interpreted. For ancients, go to your local public library and see if they have Johannes Quasten’s Patrology or Hubertus Drobner’s The Fathers of the Church. Look up the author in The Dictionary of the Middle Ages or The Dictionary of Byzantium. In the case of Cuthbert, see what the Cambridge Companion to Bede may have to offer. Yesterday, on a madcap journey about the Scottish side of the Solway Firth, some friends, my wife, and I visited Sweetheart Abbey, Caerlaverock Castle, the Ruthwell Cross, and (accidentally) a section of Hadrian’s Wall. 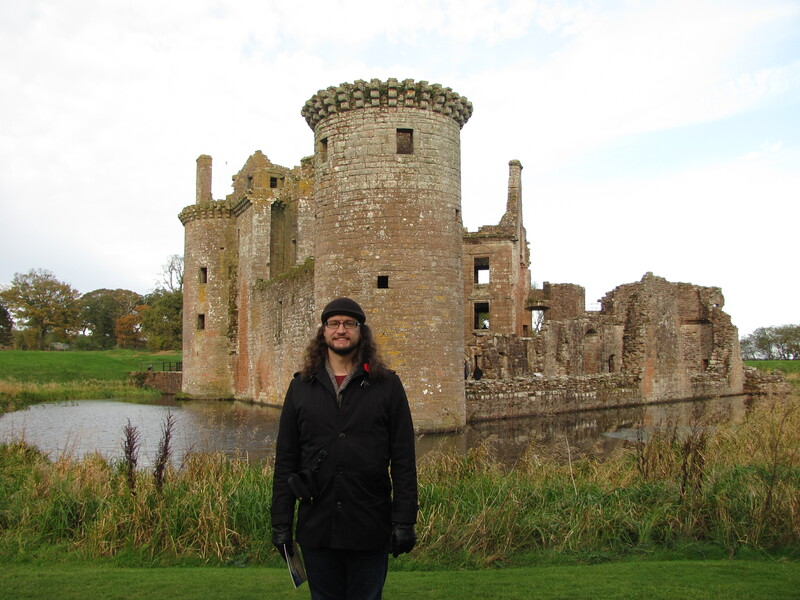 The most interesting of these items was, in fact, Caerlaverock Castle, being the only castle I’ve visited with a moat full of water. 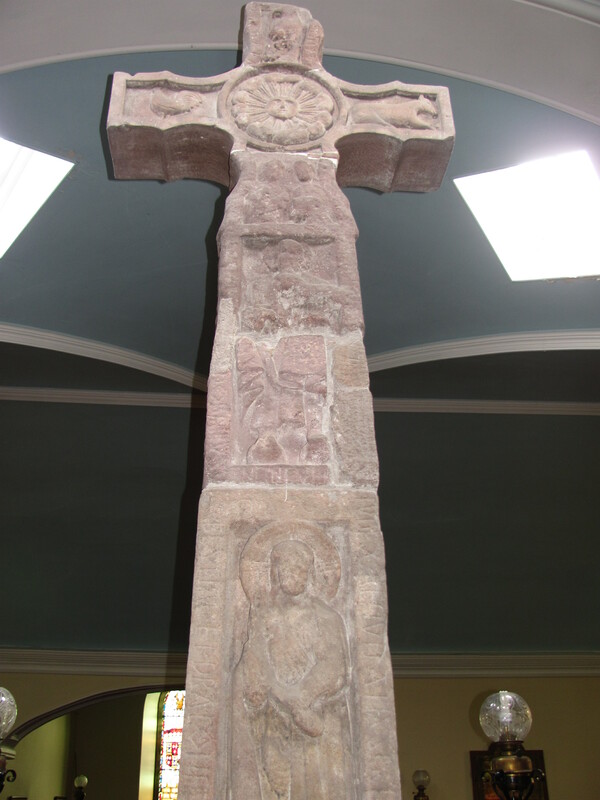 But since this is my blog about Christian stuff, I’m here to talk about the Ruthwell Cross. According to Historic Scotland, the Ruthwell Cross is a late-seventh-century (others say eighth-century) Anglo-Saxon stone cross erected in Ruthwell back in the days when this part of Scotland was part of the ancient kingdom of Northumbria. A few decades, then, after the Sutton Hoo ship burial with its very fine artefacts; probably within the lifetime of the historian/Biblical scholar/Latinist/antiquarian/monk Bede (saint of the week here). St Wilfrid was alive and active at this time — the North of England and South of Scotland had been largely Christianised in this century through the efforts of people like Wilfrid and Sts Aidan (saint of the week here), Cuthbert (saint of the week here), and Kentigern/Mungo (saint of the week here). King Offa of Mercia (in the Midlands) has yet to be born, but his pagan predecessor Penda — last pagan king in England — is dead. We are still a century from the Vikings’ arrival as raiders in Northumbria, and less than a century from the (possibly) Ruthwell-inspired Dream of the Rood. 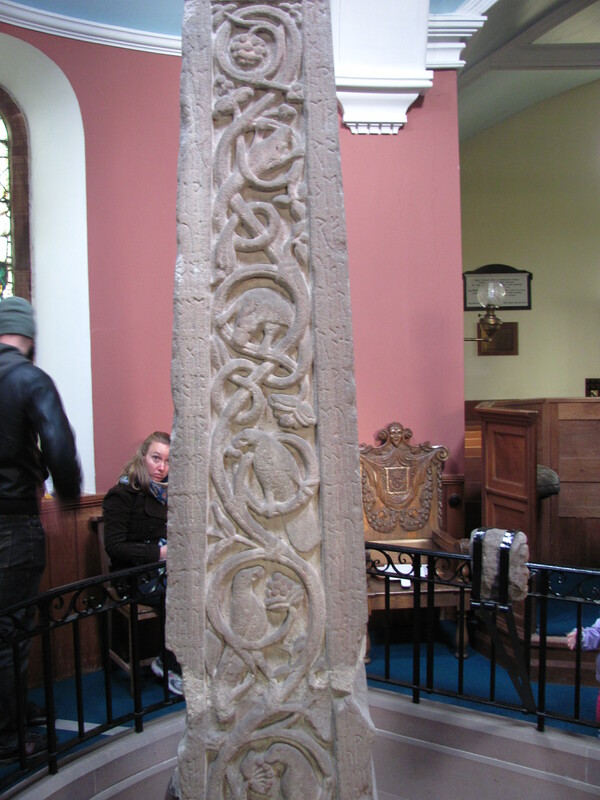 Beowulf may have been written by the time the Ruthwell Cross was erected; then again, maybe not. 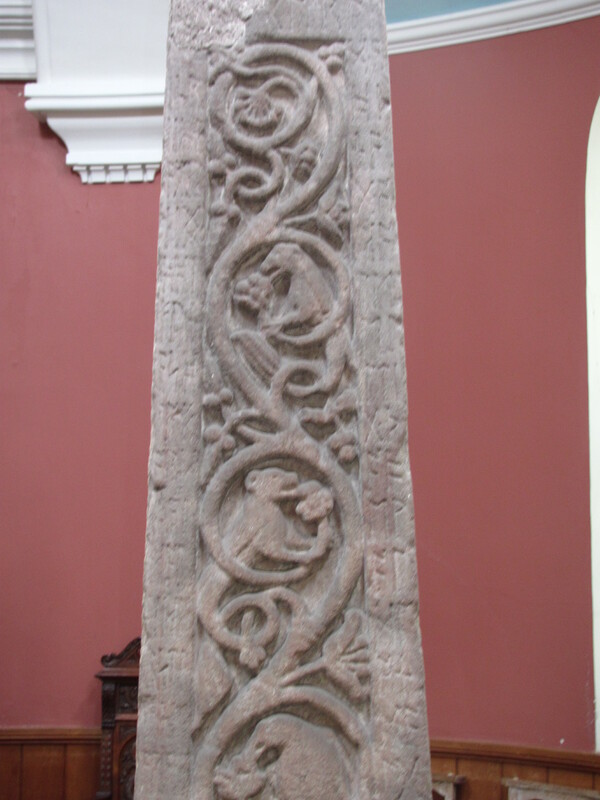 The Ruthwell Cross is contemporary to the Lindisfarne Gospels. 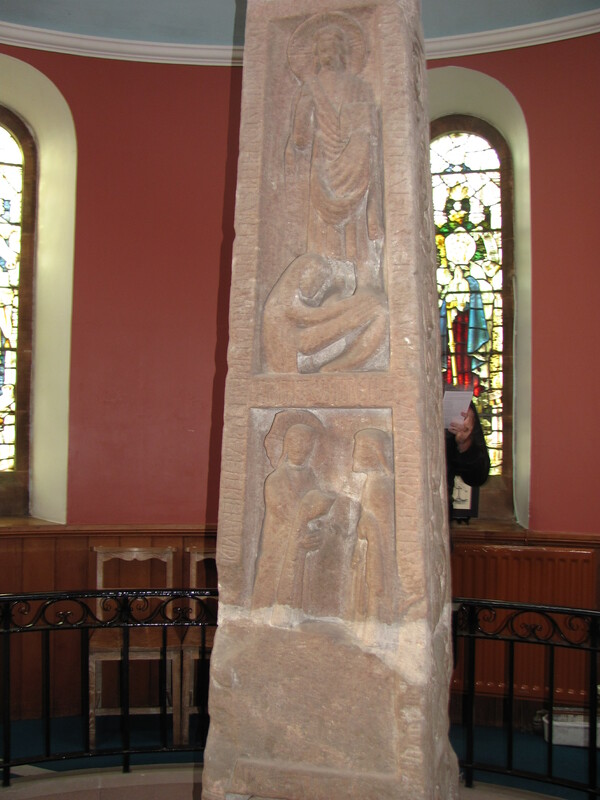 All of this is the context of the Ruthwell Cross. The peoples of Britain are fighting one another, largely Christianised, producing world-class literature in both Latin and Old English, producing beautiful works of sculpture and manuscript illumination. The material culture of the Anglo-Saxon world of Northumbria bears the marks of its Celtic neighbours/enemies/subjects, the far-off Mediterranean world of Rome and Constantinople, and homegrown ‘Germanic’ images. I first heard of this cross in the Everyman Book of Anglo-Saxon Poetry that includes a translation of the poem inscribed on it in Anglo-Saxon runes. I had no idea it would be so . . . big (5.2 m tall). And full of pictures. And also have Latin on it. But it is and does and does. The faces are carved with images from the Gospels as well as a couple of saints, although I’m not sold that the image with ‘ST PAVLVS’ inscribed over it is actually Sts Antony and Paul because the rest are biblical. 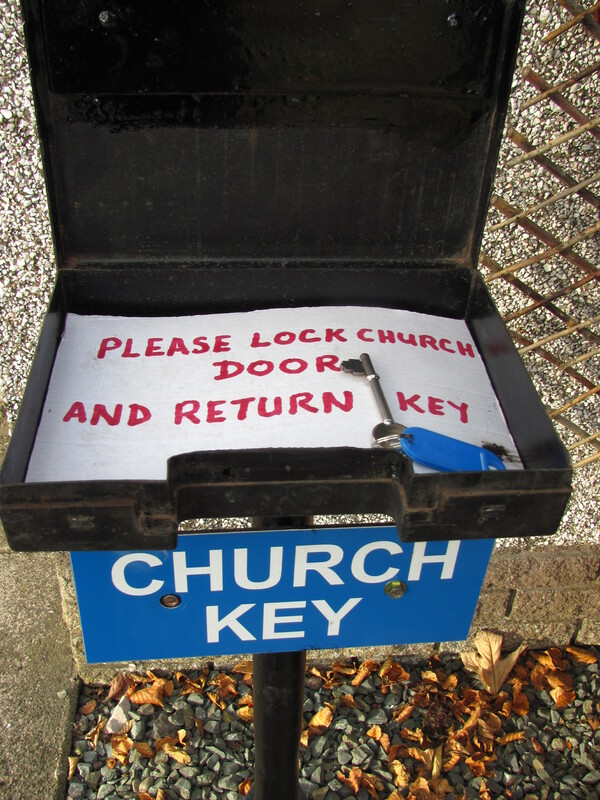 Maybe there’s more inscriptional evidence I could not figure out. The sides are carved with vine designs of high quality. 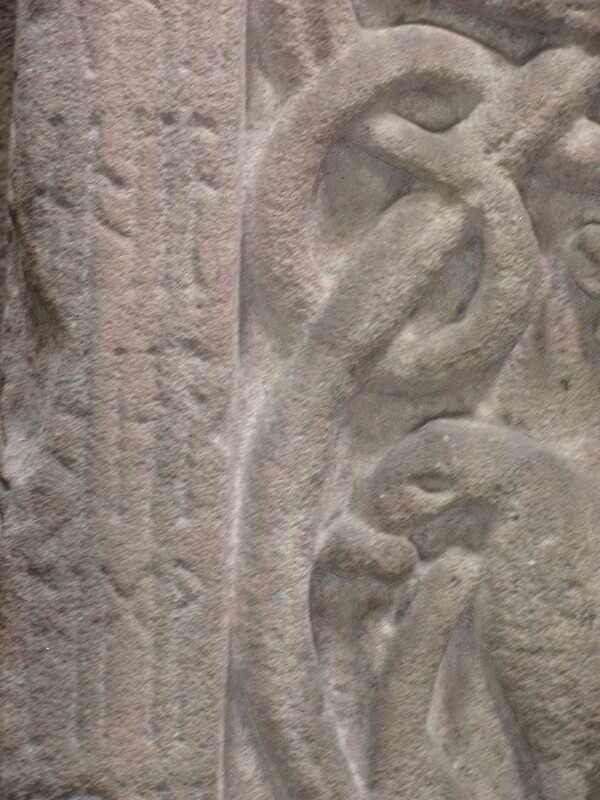 South side of the Ruthwell Cross; people don’t know what the archer dude up top means. Maybe, ‘Archers are awesome’? 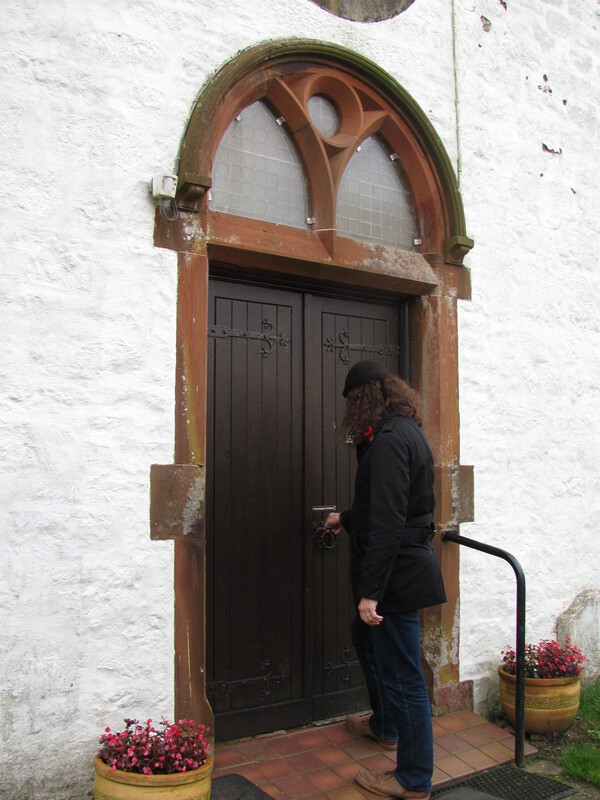 It is housed inside the local parish church at Ruthwell. This, as I understand, is about where it stood for 1600 years, until in the 1630s it was broken into bits and stored beneath the floorboards of the church because it is, apparently, idolatrous. In the 1800s it was removed and taken outside to the manse garden. Later that same century, it was returned to the interior of the church. The cross arms are missing, and what you see on it is a nineteenth-century carving that is not based on anything other than fantastic Victorian whimsy. 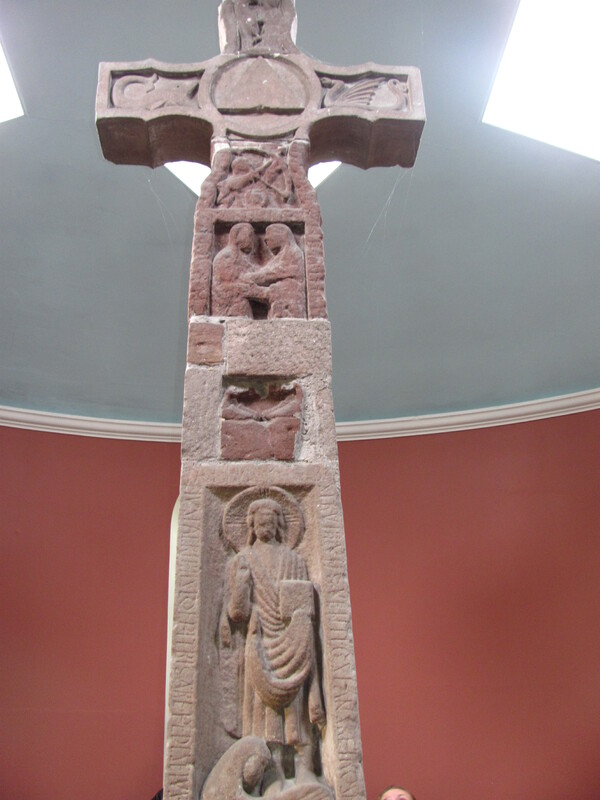 Like the Dream of the Rood, the Ruthwell Cross inscription combines the suffering of Christ on the cross with the marital values of Anglo-Saxon society. Such a blending of imageries is also visible in the poem Andreas as well as in Beowulf — the difference being that in Andreas a Mediterranean Christian tale is given Germanic warrior virtues, and in Beowulf a Germanic warrior tale is given a few Christian morals and references. In the Lindisfarne Gospels, the blend of Anglo-Saxon and Mediterranean is visual, not ideological. Anyway, this blending shows the might of Christ, mocked on the Cross but still the great King. He is at once in control, choosing to mount the Cross, and at the mercy of others, wounded with spears. It is the great mystery of the Cross, put into a form that Anglo-Saxon culture could comprehend. All in all, it was a delight to see this large, magnificently-carved monument from ages past. May we today find ways of communicating the timeless power of the Cross to our own culture.